A: Well, Tom, spring training has changed somewhat in certain areas. The most visible one is the fact that players used to come to spring training to get into shape. Nowadays, players come “in shape”and are more concerned about getting their timing down, pitch control, and other baseball activities. Players want to win jobs in spring training more than ever. Since the players come in shape now there is no need for the position players to come too much later. I think most players still think spring training is too long; their season is such a grind that they really are ready much quicker because they report to camp in shape. The day-to-day routine still remains somewhat the same. You still have to allow for time for all the fundamentals to be covered. 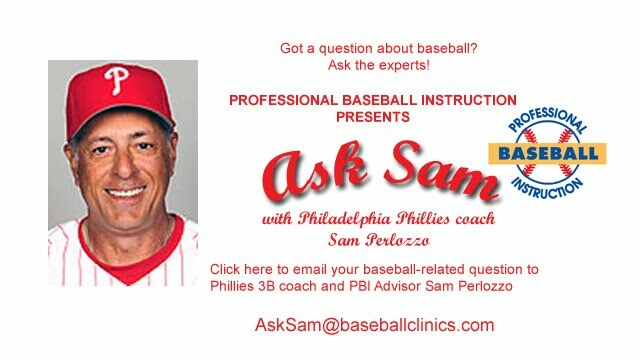 A: Chris – If your son wants to go to school and play baseball then I would suggest he go to some showcases or even better, to a place where they actually work out your son and help him get into a college for his level of play. PBI would be the best place to ask. I know my son went to one and they sent film out, evaluated his talent and suggested schools that were of his talent level so that he would be sure to get the best chance to play.